Firefighters on Tuesday battled what appears to be a suspicious blaze that broke out at a home in Daly City. Bob Redell reports. 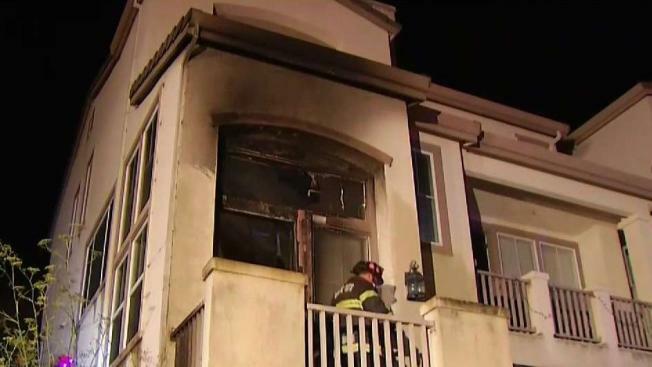 Firefighters on Tuesday battled what appears to be a suspicious blaze that broke out at a home in Daly City, according to the fire department. The fire ignited around 3:15 a.m. on the front porch of a home located along the 200 block of Bay Ridge Drive, according to fire officials. A man who lives at the home thinks he knows who may have started the fire at his parents' home. Samuel Wong said he has been in a dispute over money with that person. Wong awoke to his dog barking and later came across the flames. He helped his girlfriend and two other friends escape through a side window. Everyone in the home managed to get out OK. The flames burned up the front door and burst through a window, setting off fire sprinklers, which helped keep the fire from burning farther into the home. An investigation into the blaze is underway.